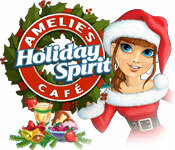 Celebrate the holidays with Amelie! Decorate and upgrade different Christmas cafes, prepare a variety of yuletide favorites for your guests, and earn enough money to fill Santa's sleigh! 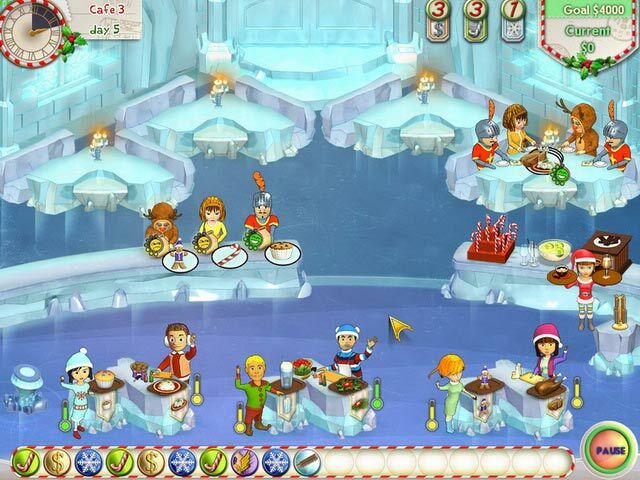 With simple but challenging gameplay, delightful holiday graphics and three Time Management modes to master, Amelie's Cafe: Holiday Spirit is your ticket to Christmas cheer! Amelie's Cafe: Holiday Spirit is rated 4.2 out of 5 by 5. Rated 5 out of 5 by merlinarcane from You'll Like This One! I can't say anything new about this game, except that it's a nice little game that presents enough challenges that it's good for replaying. I liked everything about it and would highly recommend the game to anyone who wants a time management game that they can finish without having to take stress breaks! The graphics are great, the upgrades are somewhat strategy based, and the clicking is just right. No mouse maniac clicking! I tried another in this series and got hooked right off. Give it a whirl if you like time management games! You won't be disappointed! Rated 5 out of 5 by lildreamy from Favorite game right now I've played this over and over. I actually have the halloween version too. It's a fairly simple game but sometimes simplicity is more fun. There's enough challenge to keep it entertaining but not enough where you have to replay levels over and over. Rated 5 out of 5 by kenya64 from Niiiice! Love this game! Hours of fun! There are so many different tasks going on at the same time! Rated 3 out of 5 by LilaJane from Repetitive I recently bought Amelie's Cafe: Halloween, and enjoyed it. Unfortunately, I got tired of this one very quickly. There are only three different cafe's, and the menu never changes except there's one new dish added in each cafe. Otherwise they keep making the same green salad, turkey and muffins throughout the game. How are green salad and blueberry muffins even christmasy? Couldn't they really come up with anything else? On top of that, there are 24 levels to each cafe, which is a lot: I got bored around the 12th level in each cafe, because there's no variety, and you basically do the same thing over and over. Simple sometimes is good, but I think there should be at least some progression to make a TM game really fun. I also didn't understand why the restaurant upgrades were so unnoticeable. The new stuff looked almost exactly like the old stuff. I couldn't help thinking there wasn't really much thought that went into this game at all. However, the game was cute and fun for a little while. It wasn't a complete waste of money, only it could have been so much better. Rated 3 out of 5 by JibbyEllison from Amelie's Cafe: Holiday Spirit??? 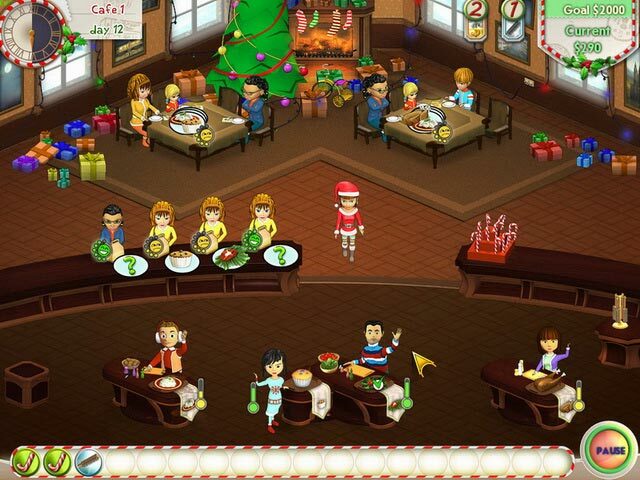 Amelie's Café: Holiday Spirit is a game where you run a total of three cafe's. People enter the café and you have to collect their orders. Then you click on your employee's to make their dinner and then you just serve the food to the customers! That's basically the story of the game. Sometimes, the game gets on top of you, so you have to use the candy canes to calm every one down but it's quite boring after about 5 minutes, just doing the same thing over and over again. Upgrades/ New items are available every so often but the game is still quite boring. The visual quality is bold and simple and the fun factor is 2 and a half stars because you do the same thing over and over again. I know the other reviewers scored this game highly, so they obviously liked the game but I don't know who would like this game! 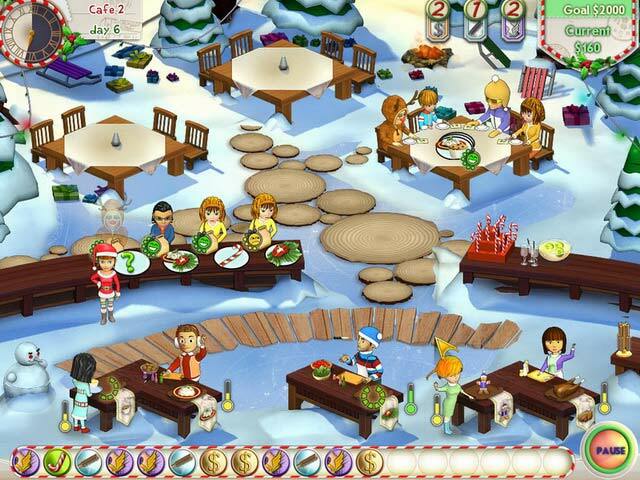 Decorate three Christmas cafes, prepare yuletide favorites for your guests and earn enough money to fill Santa's sleigh!